An interesting trend has been brewing in the travel business. Quietly but surely, Google Reviews has been expanding their online review market share for brick and mortar businesses. Since hotels, inns and B&Bs are a 100% location-driven business, this change directly impacts both their revenue and branding. Online reviews left by strangers have become almost as trusted as personal recommendations. However, placing this much trust in reviews requires the user to be able to filter real reviews from fake ones. This sorting process can be extremely frustrating, especially on websites like TripAdvisor where everything is controlled by an almighty “secret algorithm.” Still, hotels and inns have been under the TripAdvisor spell for a while now. TripAdvisor dominates the conversation to such a large extent that I felt the need to write a 3500-word article about how to curb your hotel’s obsession with TripAdvisor. Meanwhile, Google with its “of course, we can do it better” mantra has beefed up its own review platform, which is fully integrated into its existing search and maps empire. They always play to win. Before trying to understand the impact of the new and improved Google Reviews on TripAdvisor, let’s talk about the other hyper-local-focused review platform…you know, the one that inspired a South Park Episode. I am, of course, talking about Yelp. Looking at where Yelp stands today is a window into how things might play out for TripAdvisor in the not-so-distant future. Here’s the story of Yelp. Yelp was started in 2004 by ex-PayPal employees Jeremy Stoppelman and Russel Simmons (not Def Jam). PayPal has produced more billionaire founders than any other company. But I digress. Hereʻs the main thing. As was the case with many review websites, the best intentions did not lead to the best outcomes. User-generated (free) content fueled the massive growth of the website and led them into a 2010 IPO. Two words…Advertising Dollars. This is where things got out of hand. Yelp pushed their ads real hard on local businesses, just like TripAdvisor does today with hotels. This practice brought about several accusations of extortion by business owners against Yelp. Most complaints focused on either positive reviews being removed from a business’s page if they did not buy ads, or on Yelp letting competitors pay for ads to remove/hide negative reviews. The similarities to some of the review/ranking/advertising issues TripAdvisor is experiencing right now is surreal. Enter lawsuits with the Federal Trade Commission. Although the FTC dismissed these cases, the cases highlighted the plight of small business owners being held ransom by Yelp ads and Yelp Elites. It always reminds me of the stressed-out B&B owner in tears about his TripAdvisor reviews. Most ethical business owners moved their advertising dollars to platforms that were not squeezing the small business owner. Of course, movies like Billion Dollar Bully did not help Yelp at all. Nothing good or bad lasts forever. Since 2014, the general population has been moving toward Google Reviews, Google Maps, and Instagram…and advertising dollars have followed. The accessibility of these platforms is much better than anything Yelp had to offer. While user reviews remain very relevant, the way people like to look at information has changed. People find it easier to communicate with businesses on Google/Instagram/Twitter than on Yelp. Result? Advertising declines → stock price declines. I could not agree more. Likewise, my chef/restaurant friends have severely limited the time they spend on Yelp. Instead, they check food photos online to see how their product is being received and shared on sites like Google Reviews and Instagram. Instantly qualifying the person posting a review and having social proof is a great thing! Also, these mediums offer a greater chance for a business owner to interact directly with both negative and positive reviewers. Declining But Not Dying (Yet). Yelp is not shutting down anytime soon. Hey, not that long ago (2009), Google wanted to buy Yelp for $500 million! Yahoo threw their hat in the ring with a $1 billion number soon after. Yelp is still going pretty strong, and still garnering new reviews and content. At the same time, even more reviews and ad dollars are pouring into Google and Instagram. Plus, we know that Google is definitely from the “if you can’t buy it, beat it to pulp” school of thought. So they will make sure that Yelp does not make a big comeback. Guess what? 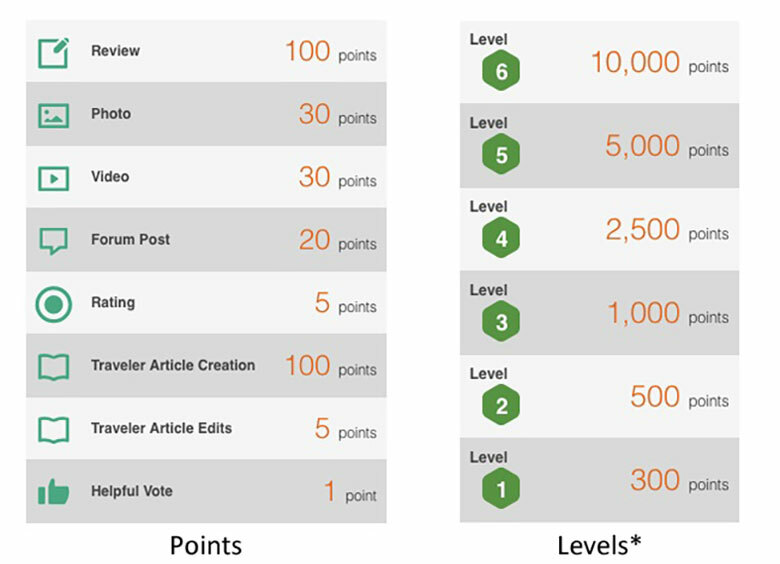 The points earned by reviewers do not have a monetary value. It is apparently a game. A game in which you rank your entitlement on a website that then turns around and sells ads (for money) on the free content you uploaded on their website. It’s like an episode of Black Mirror… where you are the game! If you are bored and into gaming, Fortnite and Red Dawn 2 are very good. Why not try those instead?Guess what? The points earned by reviewers do not have a monetary value. It is apparently a game. A game in which you rank your entitlement on a website that then turns around and sells ads (for money) on the free content you uploaded on their website. Also, see Anthony Bourdainʻs quote above. It also applies here. Same people, different platform. Google gets tons of cash from TripAdvisor spending on Google Ads. TripAdvisor sells advertising on their own website in part to support their Google Ads habit. As more travel industry ad dollars shift toward Google and Facebook, TripAdvisor has gone hard into pushing their own advertising platform while offering very little analytics and support in return. One of their offerings: paying for a link. Can you believe in 2019 you can pay just to get a link from another website? You know, like an online directory listing circa 2001. It’s like if you did not have a link to your hotel from TripAdvisor, your guest would never be able to find you after reading your reviews. They must be familiar with this little thing called Google, where you can type in a hotel’s name and magically find it! We know that Google is king when it comes to advertising. How else is Google Reviews tightening its grip on the hotel review market? Two initiatives stand out for me. Google has been a verb for a while now. 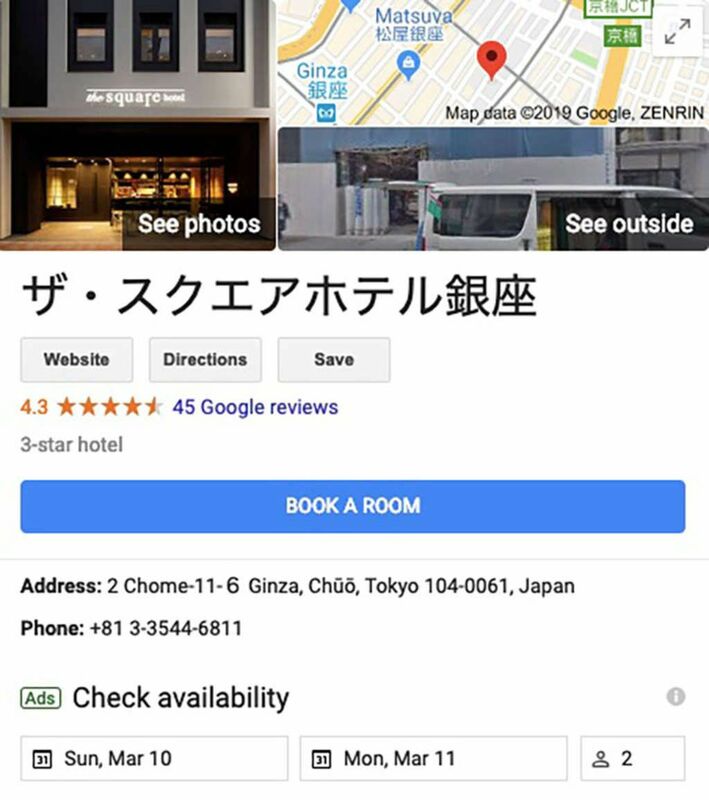 So yeah, when you “Google a hotel” in search, you get the hotel’s location, hours, phone number, reviews, website, and rates in a nicely packaged search box. This offering is even more relevant on mobile. I am an Android user. (Apple still gets my laptop and power adapter dollars.) One of the main drivers of Google Reviews has been the frequency of Google asking you to leave a review based on where you are. I had to turn that off on my phone. But the fact remains that Google has made it super easy to get you to leave a review based on your GPS location while logged into your Google Account. This feature definitely adds to the review’s authenticity, as the user’s Google account and location provide some proof of them actually having been at your location. Meanwhile, TripAdvisor is penalizing hotels for any reviews posted by guests using the hotel’s computer/Wi-Fi network, etc. Feels like TripAdvisor is the upside down when it comes to people leaving reviews from a location they are actually in. They would rather have user ‘crazyboog1999’ trash your hotel from their mother’s basement. Trip Origin. I have visited Tokyo many times before. All those trips were work-related, which means that I absolutely focused on location first, price second. This time it was a personal trip, and location was not the only factor. Tokyo is one of my favorite cities in the world. No matter where you are, you can get around quickly. All you need is cash, a Suica Card, and Google Maps. Time Frame. I was visiting Tokyo from December 27 to January 3, and then heading to Kyoto. This is a time of year when many local businesses are closed, and there are fewer tourists than usual. However, there is a ton of domestic travel, with families taking vacations, staying with extended family, and visiting shrines in honor of the New Year. The busiest time of year in Tokyo is March/April (cherry blossoms) followed by fall; winter is mellower, but the New Year’s shrine and family visits still make it competitive. Yes, I work in the revenue optimization business. Research. The first step for me with personal travel is to check with my industry friends. Sadly, I am not a big deal in Japan… yet. I narrowed my search to hotels in Ginza (Tokyo’s Fifth Avenue), which had less compression as a business district during year-end holidays. The Winner. Good news! I discovered a hotel with incredible rates and a great location. Downside…it was not open yet. A minor detail like that doesnʻt bother me, as I am in the business of opening new hotels. I booked my dates and locked in an amazing deal. I was curious about the product, but the pre-launch website was just a smorgasbord of stock photos. Realization. I waited for the hotel to get reviews. Two weeks before anything was ever posted on TripAdvisor, I started to see comments and photos on Google Reviews. Thatʻs when I had a moment of realization: the only place to find any reviews for the hotel from Day 1 of opening was Google Reviews. They were followed closely by Expedia/Booking/Agoda reviews that were very nicely integrated into the Google Reviews ecosystem. 2. Update Everything. Your GMB has a direct impact on all the Google activities a potential guest will do in order to find and book your hotel (search, Google Maps, etc). Make sure your address, phone number, business hours, and types of payments accepted are updated, and all links point to the right places. This is a basic and endless chore, so get used to checking this information on a regular basis. 3. Enhance It. 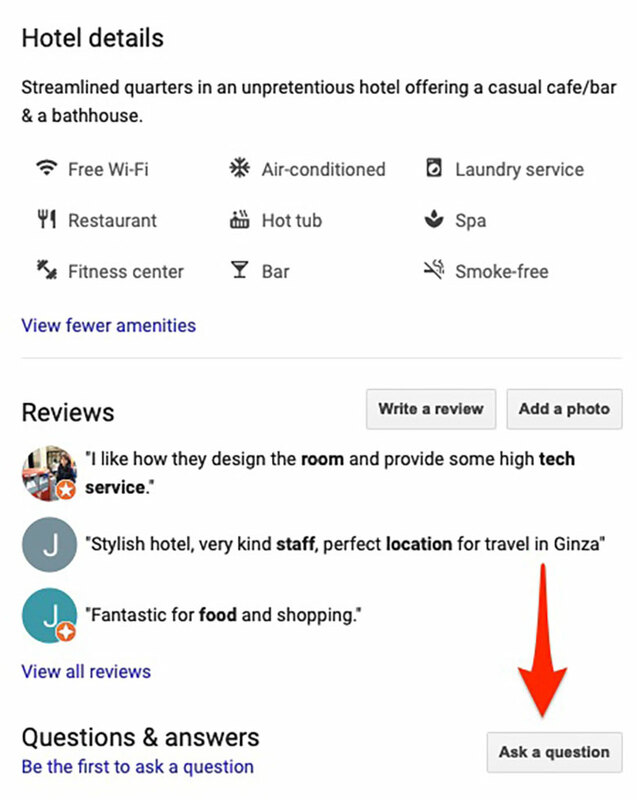 Google has added some great features to GMB that hotels should use. An enhanced GMB listing helps to grab your guest’s attention when they are researching your hotel. There is a possible impact on local search rankings, but I try to refrain from rankings talk ever since I posted this article on SEO a few years back. 3. Check Yourself. Anyone can suggest edits to your GMB listing and have them take effect. It’s a very good idea to log in and keep an eye on things. Have you completed your profile? If not, then someone else will…yes, that includes your competition. Also, you cannot count on GMB email alerts to work 100% of the time. I repeat…just this month, I encountered a 200-room hotel’s local listing pointing to a neighborhood restaurant! It’s like the Wild West out there. 4. Answer Questions. This is one of the most relevant sections of GMB when it comes to the travel industry. People have questions about places they are going to visit someday. Even after arriving/staying at your location, most people look for information on their phone before ever talking to a human. Try and get the Q&A section filled out with the frequently asked questions and answers you have buried on your website somewhere. Talk to your front desk and make a list of questions they get asked all the time. The TripAdvisor/Yelp complex has trained everyone to live in fear of bad reviews and keep your laser focus on their platform. Instead, you can help guests who are looking for information about you. Help them first, then work on converting them into paying customers in the near future. Alternatively, if you ignore the Q&A section, someone else will answer the questions for you. You might not like the answers they give. 5. Ask & Receive. It’s standard operating procedure for hotels to ask their guests to leave a review on the world’s biggest travel website (TripAdvisor). This needs to change right away. Instead, you should ask your guests to leave you a Google Review. Google reviews are clearly associated with their Gmail/G-suite accounts and in most cases are verifiable and not hidden behind an obnoxious username like “JoeMama90210.” Replying to Google Reviews directly and in a concise manner is a key advantage. You can be direct without being trapped in the despair-ridden TripAdvisor platform. I am not going to tout GMB optimization as a ranking tactic. But I can say that it will help you make more revenue. Online reviews are crucial for any business, not just travel. Over the past few years, the obsession hotels and inns have developed with TripAdvisor has caused them to lose sight of the real powerhouse: Google. All of Google’s recent upgrades have served to make them a better information center for the end user. TripAdvisor with its hyper-narrow focus might be the biggest review website in the world today, but it is getting pushed to the sidelines by a bigger and smarter competitor. You don’t have to speculate much. Just look at Yelp and how their story played out. I’d say we have a near perfect example of history repeating itself.